A room with wainscoting and raised paneling can at times appear unfinished or incomplete because not all areas have been worked on. 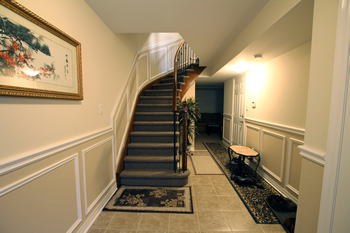 Installing appliqués wainscoting can grant you a variety of means by which to achieve the appropriate paneling of a wall. A decorative wall treatment our appliqués wainscoting and decoration allows for specific customization and fitting to particular areas throughout a room. 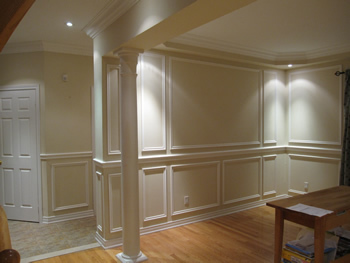 Our company offers advanced appliqués wainscoting services which are ideal for more complex room layouts and designs. Wall appliqués and installation to specification for completion and consistency. Less assessable or partitioned areas of the wall such as above or below windows can effectively be administered with panels to Canadian homes. This is a more flexible form of wainscoting and can be used in order complete a rooms paneling and therefore giving the full effect. 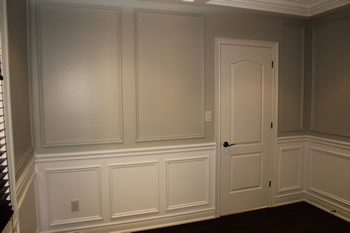 Full wall wainscoting and additional appliqué work displayed in our showroom and available to buy in Toronto and GTA. Chair rail wainscoting and installation is highly attractive when used in combination with paneling, baseboard and moldings. Appliqués wainscoting allows for the successful adaptation of square and rectangle application to more numerous or awkward areas. We provide you with an installer of a professional level. Our appliqué panels combine harmoniously with trim work, baseboards and further wall decoration. Appliqués wainscoting provides you with a way of achieving a highly distinct and attractive paneling style that assures precision and detail are not overlooked. Often a room’s layout and structure can prohibit complete and therefore consistent paneling because the basic panel format only provides coverage to certain wall areas. By installing appliqué wainscoting appropriate panels can be fixed to areas that otherwise could have been overlooked or impractical to work on. 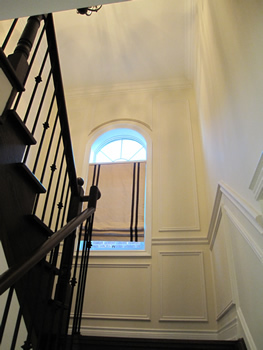 Our expertise and extensive range of choice and options will ensure our customers that our appliqués wainscoting affords the means of achieving elegant and specific paneling.